There were many great results this weekend at various locations and distances, and the undisputed highlight was Frances's victory in the 5,000 meters at Penn Relays. Frances had not raced since indoors, and though she lacked race sharpness, she was confident in her closing speed. The slow early pace played right into Frances's hands, and with 600 to go she unleashed a devastating kick that left no doubt about the outcome. Frances is making her track 10,000 debut on Saturday at Stanford, and she's looking to run the same pace for 10,000 as she ran for 5,000 at Penn, where she set a club record of 16:27.8, in order to hit the USATF qualification standard of 32:58. After seeing how confidently Frances ran on Thursday, I wouldn't bet against her! The men were also in action at Penn, where Cabell ran a 6 second PR of 14:41 in the 5,000. Cabell had a bit of difficulty with jostling in the first couple of laps, but it was nothing like the trouble Matt Rand ran into in the 10,000. Within the first 100 meters, another athlete in the crowded field stepped on the back of Matt's shoe, forcing him to stop to remove and re-tie it, which essentially ended his race before it began, as he was over 10 seconds behind the field at the 400. Matt hung tough and finished in 31:20, good for 5th on the GRC all-time list, but he was fit to run much, much faster. Phil had better luck in the 10,000, running a solid 30:34, which puts him 4th on the GRC list. Dickson was the final member of our Penn crew, and though he was hoping to run faster, the experience of running against top-level competition on the track is going to make Dix a much better marathoner when he returns to his preferred distance this fall. From my perspective, having a GRC athlete win a Penn Relays title for the second consecutive year is a ringing endorsement of the direction the team is heading, and I'm already looking forward to making it three in a row in 2016! The off-track action was highlighted by Kevin's hard-fought victory in the GW Parkway 10 mile, where he ran 50:28 in his debut at the distance, which puts him 4th on the GRC list. As Charlie's excellent article fully describes, Kevin knows how to win races, whatever the distance. 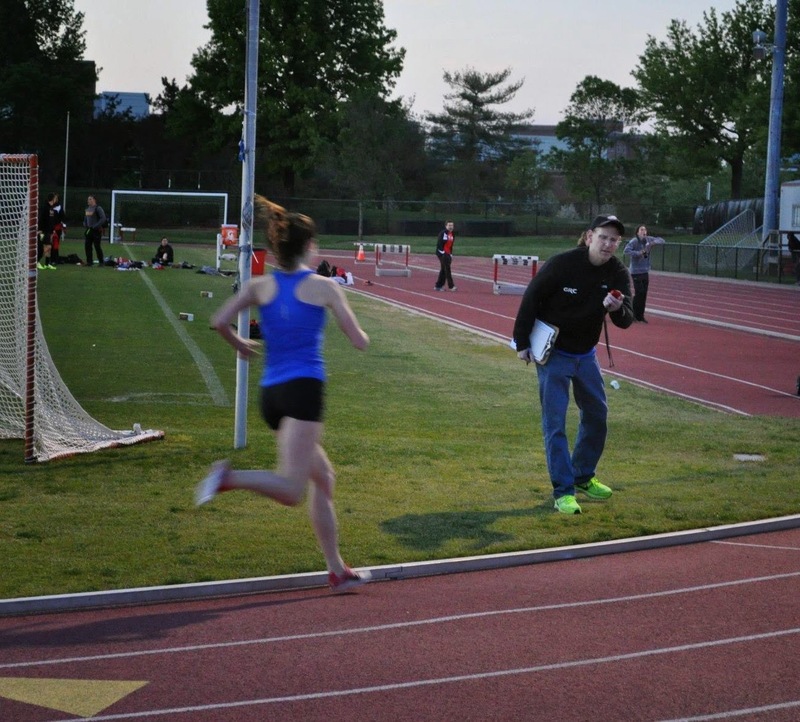 That blurry figure lurking in the background of the photo is Charlie, who ran a solo 54:41 for third. On the women's side, Shauneen ran an excellent 60:10, which was her first PR at any distance since 2009. We're going to be seeing many more PRs from that young lady as the season progresses. The other major action of the weekend was at Pikes Peak, where we discovered, much to our collective dismay, that the course has been altered due to the demise of White Flint mall, and the changes were not for the better. Despite the lack of the sharp downhill at the end and the addition of a fairly steep uphill at the beginning, we had strong performances across the board, as Luke was third in 30:33, Jake was sixth in 31:51, Wertz was 8th in 32:01, Sean was 9th in 32:03, and Pat K ran a big PR of 32:34. We're set for a 7:15 start at BCC on Wednesday, so meet for the warmup at 6:30. I'll sent the women's workout separately. The GRC traveled hither and yon for race upon race last weekend. In case you were living your life to the fullest instead of refreshing your browser, the following is a roundup of the weekend’s activities to get everyone back on the same page. No reader left behind! Susan Hendrick won the Westminster Main Street Mile on Wednesday with a time of 4:51.03. She’d like to thank her husband Nathan for driving her all the way to the Maryland hinterlands without the use of his Uber fare meter, as well as her Beagle puppy, Delta, for being well-behaved and patient in her crate all evening. Frances Koons won the Olympic Development section of the women's 5k at The Penn Relays on Thursday with a time of 16:27.84 to set a new club record and win a flashy new timepiece. 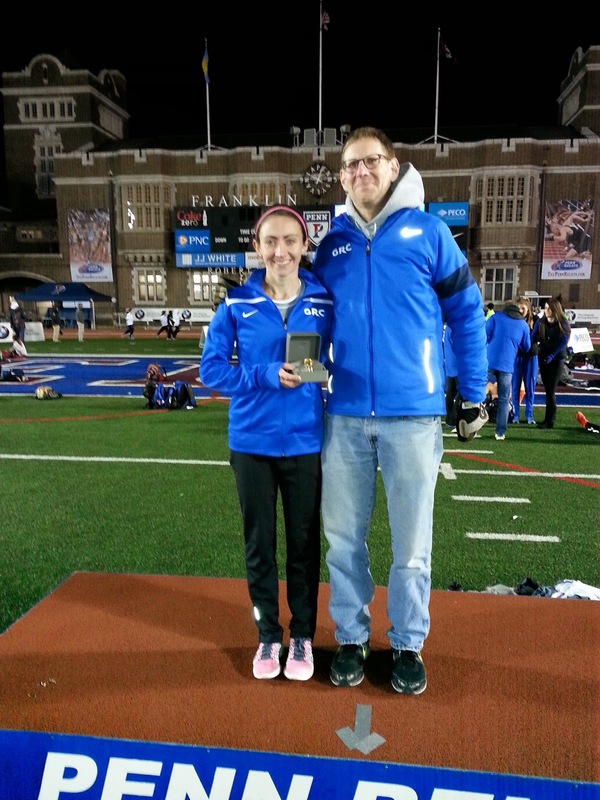 While far from her 5k PR, Frances’ strong season debut and race smarts bode very well for faster times through the spring. Phil Royer and Matt Rand competed in the Olympic Development section of the men's 10k at Penn, running 30:34.91 for fourth place and 31:21.24 for eighth place, respectively. Matt’s race performance was hampered when he lost one of his shoes in the first lap and consequently also lost the pack of runners he wanted to stick with. He will work to utilize a double knot next time. Cabell Willis had a strong final mile to run 14:41.69 for an almost 7 second PR and eighth place in the Olympic Development section of the men's 5k, and Dickson Mercer ran 15:32.85 for 33rd. 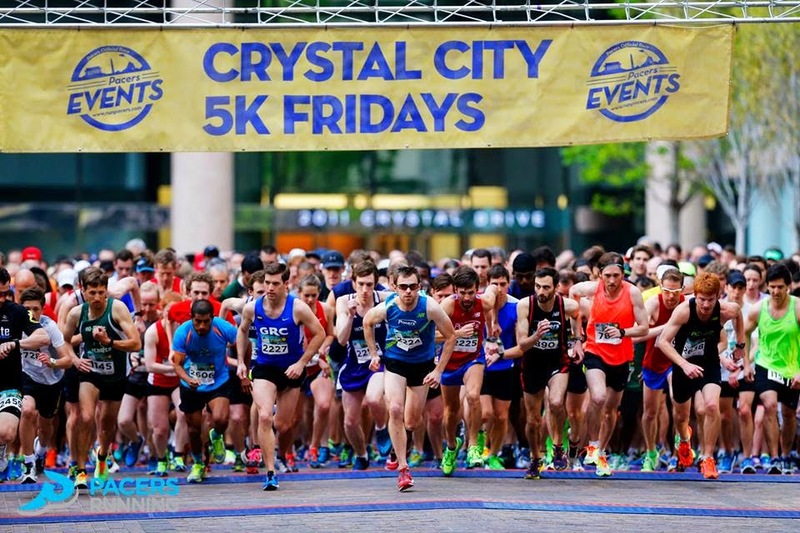 At Crystal City's final 5k Fridays race, Charlie “Tuneup” Ban ran 16:00 for second and Kyle Cooke clocked 16:33 for eighth. 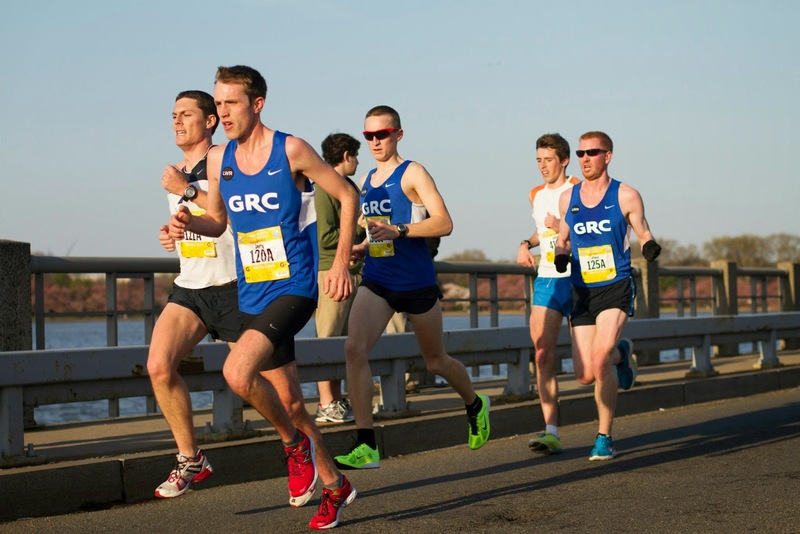 In Alexandria at the George Washington Parkway 10 Mile on Sunday, Kevin McNab ran 50:28 for the win, the number four position on GRC's all-time list, and a solid PR for his first ever 10 mile race. Charlie "Double or Nothing" Ban raced for a second time in one weekend and secured third place with a run of 54:41. Shauneen Werlinger ran very well to finish in second place in a time of 60:10, a PR. Also on Sunday, a few miles north in Maryland, GRC's cohort of Pike's Peek runners faced a new course layout, which they found to be slower than the excessively downhill design of previous years. Still, the GRC was undeterred and able to achieve a strong showing. Luke Meyer led the way with a time of 30:33, good for third place. Jake Klim was sixth in 31:51, Dave Wertz and Sean O'Leary finished seconds apart in eighth and ninth place, respectively, with times of 32:01 and 32:03, and Pat Kuhlmann set a PR of 32:34 with a 14th place run. For additional reading, the GRC's Red Fox and other Redhead have both written thorough reports of the race which are full of insight and wit. Be it known that excellence in blogging here at the GRC is strongly correlated with red hair. Last but not least, in her hometown of Toledo, Ohio, elusive jetsetter Beth Young decided to forego a long run in order to enter the Glass City Half Marathon. Her workout effort of 1:24:29 was good for 13th place. Stay tuned for another weekend brimming with races near and far. 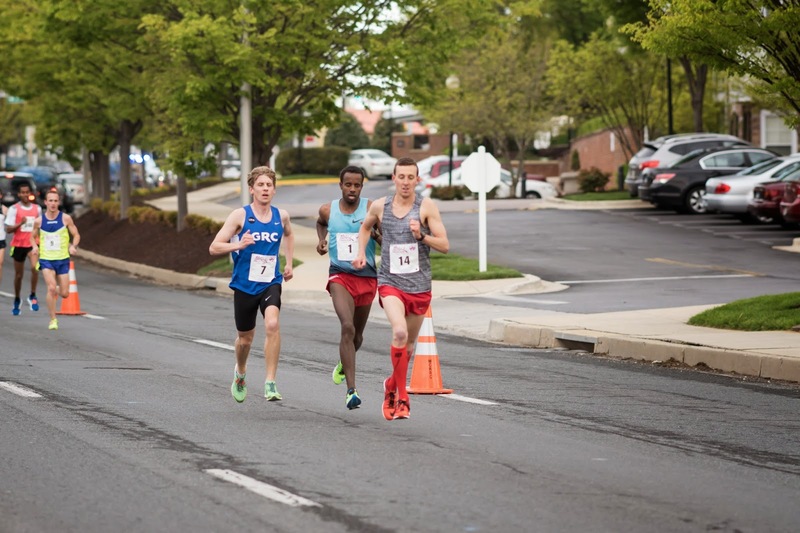 Highlights include GRC’s speedier set taking to the track at the Maryland Twilight meet on Friday evening in College Park, and the distance-oriented crew heading to Philadelphia for the 10 mile Broad Street Run on Sunday. A preview will arrive in the next few days! 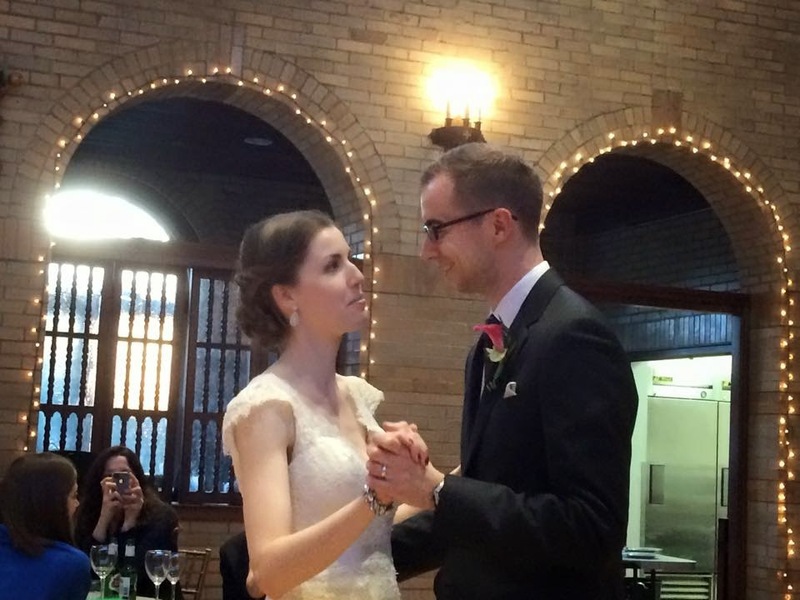 Chuck "Big City" Kacsur and Kate Burke tied the knot last evening in a ceremony in downtown Washington, D.C.
Kacsur, who also plays an extra on AMC's "Mad Men," holds the club 800m record of 1:53.85. Frances Koons runs 16:27.84 at The Penn Relays to set a new club record, unleashing a furious kick to win the Olympic Development section of the 5000 meters. Get that girl a cheesesteak! Susan Hendrick blazed to a time of 4:51.03 and first place. Said Susan of the performance: "It's always exciting to race in a GRC jersey. It's even more exciting when you race in a GRC jersey and it lasts less than five minutes." Our marathoners may disagree, but we strive for diversity around here! Week/weekend preview: 5Ks, 10Ks, 10 milers, oh my! Step right up, folks, because the GRC has a little something for everyone this week! 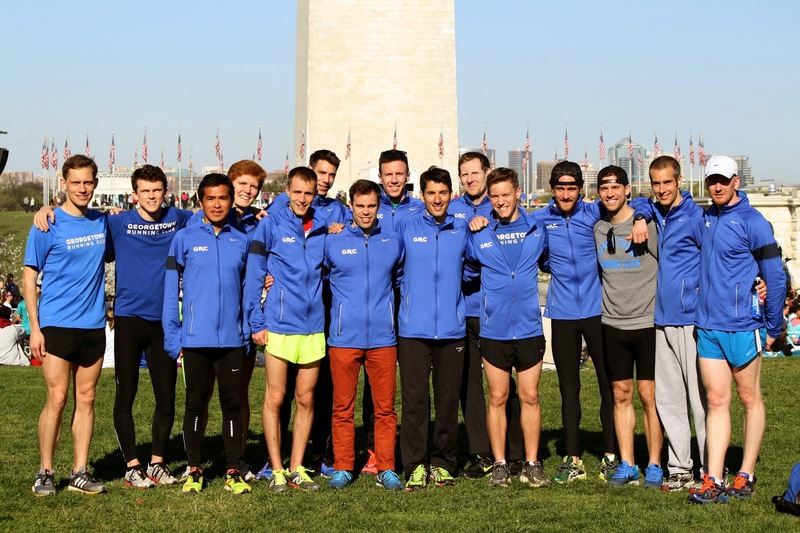 The team will truly showcase its versatility over the next several days with a variety of race distances on the docket and a variety of fit people eager to run them. First up is Susan Hendrick, who will test her speed and skill at running in a straight line on Wednesday evening at the Westminster Main Street Mile, the site of her club record-setting performance of yesteryear. Known far and wide for her ability to seek out and seize opportunities to run very short distances on the roads, Susan also entertained the thought of entering the Kid's Kilometer at the Father's Day 8k this year (register here readers, just $5!) until she learned that the congratulatory voucher for free ice cream is only given to finishers under the age of 12. Darn! Next, GRC's injury-thinned track group heads to the hallowed Franklin Field on Thursday evening to test their race wits at The Penn Relays. Frances Koons, racing for the first time since competing at the USATF Indoor Track & Field Championships in February, will do battle with the 5000 meters. Frances and Philadelphia go together like a hoagie roll and thinly sliced grilled meat, so it's fitting that she will kick off her outdoor season at Penn. The 5k is also on tap for Cabell Willis, who came away from Bucknell a week and a half ago with a shiny new PR in his back pocket, and he's already itching for a fresh one. Dickson Mercer, our converted marathon runner, will look to dazzle us all with his 5k speed as well. 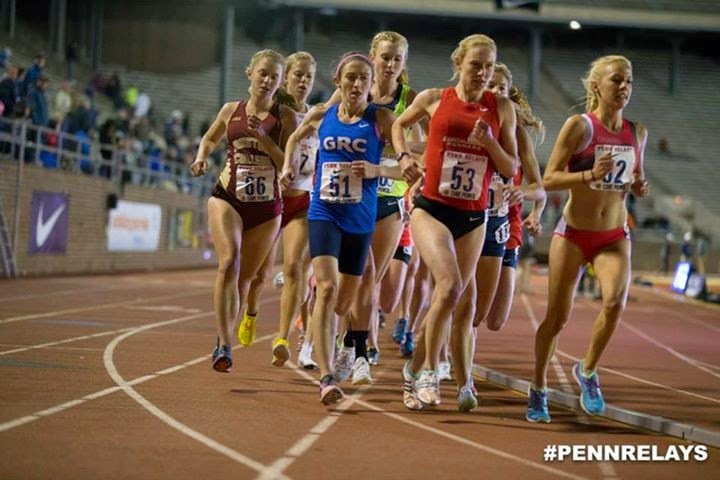 Braving the 10,000 meters, the longest race the track has to offer, Phil Royer and Matt Rand will wrap up the Thursday action at The Penn Relays with a late night gun time of 10:55 PM. An outside observer may think that a race lasting 25 laps and held in front of a few half-asleep fans and bus drivers might not be the choicest of ways to spend a half hour, but they would probably be wrong. Phil and Matt are both ready to challenge their PRs of 29:59 and 30:09, respectively, and what could be more exciting than that! 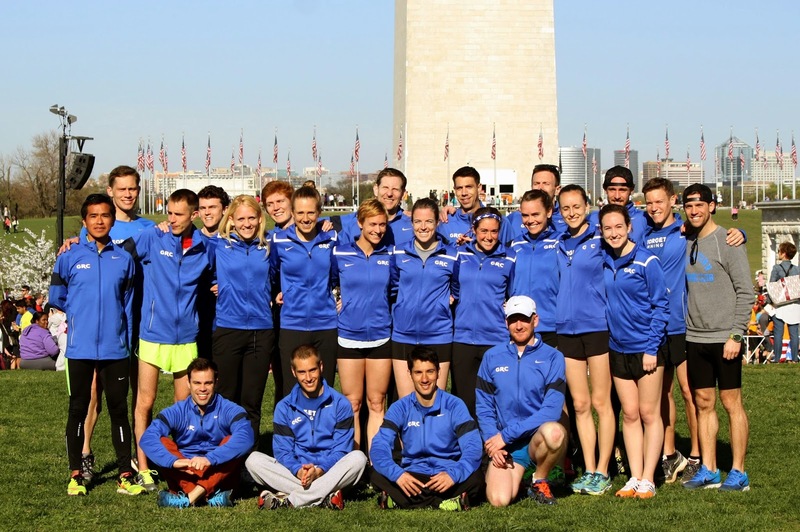 After a quiet Friday and Saturday, the team will go out with a bang on Sunday, with both the George Washington Parkway Classic 10 Mile and Pike's Peek 10k boasting members of the GRC. 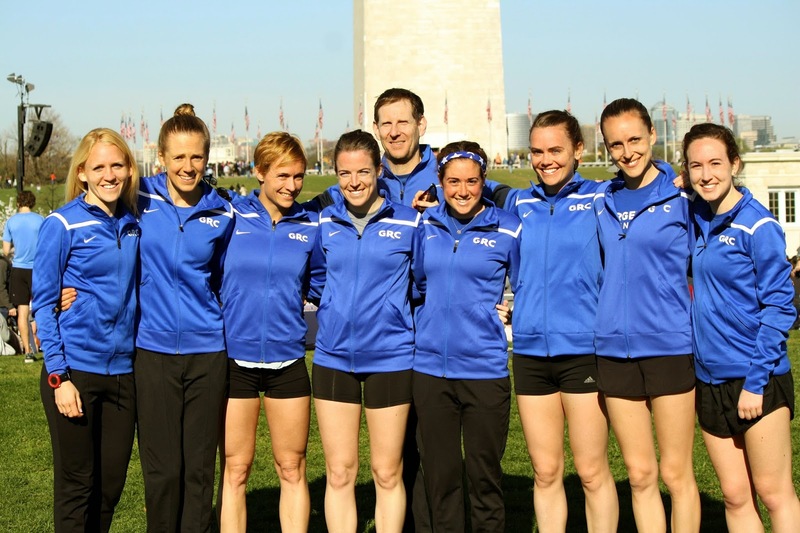 Shorter-distance stalwart Kevin McNab will strive to PR in his first 10 mile race, and Shauneen Werlinger will also throw her hat into the ring after illness thwarted her Cherry Blossom plans. Pike's Peek will feature a slew of GRC men including Luke Meyer, Sean O'Leary, Jake Klim, Dave Wertz, and Pat Kuhlmann. This race is a classic Maryland pastime akin to putting Old Bay on your crabs and being mad about the Purple Line. On this fast, net downhill course, anything is possible! Results will be posted right here, so don't forget to check back often. Might as well bookmark this post for the next few days to be safe. Brian Young, aka Breezy, a lawyer by trade, founder of Breuters News Service, and runner of 2:44:59 in yesterday's Boston Marathon, was quoted in both U.S. News and the Associated Press, proving he is an all-around master in the art of communications. Pre-race, in U.S. News' "Your Body on the Boston Marathon," Breezy shared the inside scoop that to "run that course well, it's really a cerebral challenge." He also shared the details of his USADA-approved breakfast of champions. AP reporters also tapped Breezy for their final quote in their race coverage. "It had the same energy as it had when I last ran it in 2009," [Breezy] said standing near the finish line. "I don't think the crowds or the runners have missed a beat. It's always been about the competition and it's still going to be about the competition." GRC field correspondents Beth Young (at left) and Lindsay O'Brien have bravely dressed for the occasion and are located at approximately the halfway mark. Those are some dedicated teammates! According to this article in the Boston Globe, DC had the fastest average qualifying time (3:16:03) of any other state with more than 100 runners qualifying and registering for the 2015 Boston Marathon. That's a full three minutes faster than the next fastest State, Massachusetts (3:19:06). Perhaps Charlie Ban can run this analysis on a county-level basis? It was a perfect day at Cherry Blossom--the weather was ideal, the trees were in full bloom, and it was a glorious setting for a race--so what could have gone wrong? We found out the hard way, and although the race organizers did an outstanding job of adapting on the fly to unforeseeable circumstances, I couldn't help but feel a little cheated by the short course. We'll never feel confident of the actual distance contested, nor will we ever know what would have happened if the race had gone off as planned, and that's a shame. But what I do know is that our crew made the most of the situation, and we had some excellent performances. Teal, Maura, Emily, Balmer, Wertz, Charlie, and Zak almost surely would have run PRs, and Outlaw would have been close. As it was, they'll all have to be satisfied knowing that they ran hard and competed well, and that the PRs are coming soon. Further down the chain of causation, Kieran would surely have run a PR if the course was accurate and if his shoe had not come untied, causing him to convene an unplanned conference of at least 30 seconds with the GRC brain trust on the side of the road at mile 2. 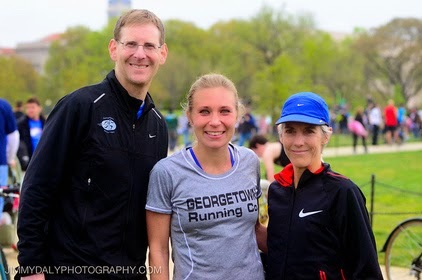 Though not on PR pace, Kristin and Dave O ran very solid races as they work their way back to full fitness. Our entire Cherry Blossom crew will be back, better than ever, in the coming weeks. We never have to worry about the validity of the marks on the track, and we had some excellent performances at Bucknell and Hopkins. Cabell won the unseeded 5,000 at Bucknell in 14:47.4, which was not only a PR, it was his first PR at any distance since 2012. Cabell closed in 29 for the final 200, and he clearly has more gas in the tank, so we're going to see many more PRs from him in the very near future. Also at Bucknell, Stewart ran 15:04, for an amazing 33 second PR. Stewart was so far into uncharted territory that he was probably too conservative for most of the race, but he knew what to do when he heard the bell, as he closed in 64 for the final 400. At Hopkins, Matt Rand ran 15:03 in extremely windy conditions. Matt had the benefit of excellent pace-making from Phil for 3k, but once he was on his own the wind hindered him greatly. Still, it was an excellent tuneup for the 10,000 at Penn Relays. On the women's side, Susan ran solo from the gun and struggled with the wind in the 5000 but got in a good effort, and Tina ran a solid 4:51 for 1500. They'll both be back for more in the coming weeks. We're at BCC on Wednesday for our normal 7:15 start, so meet for the warmup at 6:30. Breuters Wire Services -- Washington, D.C. 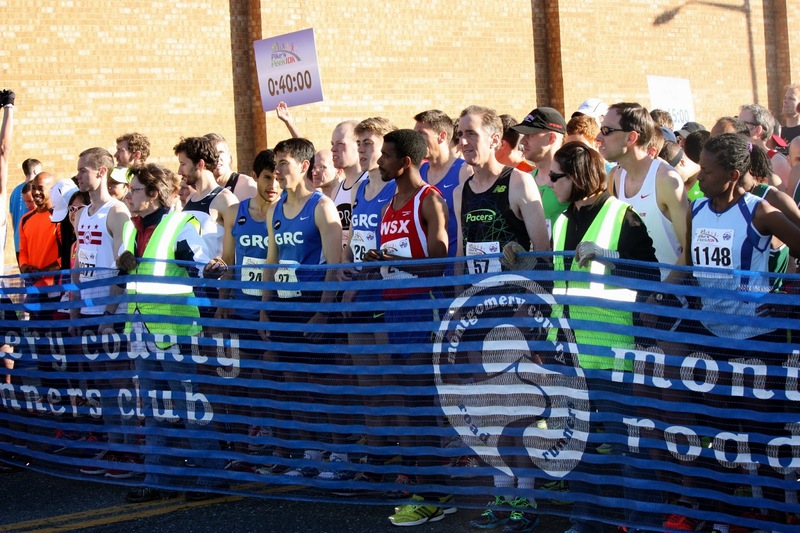 Preliminary results are in for the Cherry Blossom Ten Miler, which was on a short course. Cherry Blossom isn't the only game in town this weekend. There was 5k action on the track, too. And a few PRs. Stewart 15:04. 30 second PR! On an otherwise quiet weekend, we had very nice performances from Jake and Cabell. Jake won the Santa Anita 5k, which started and finished on the horse track at Santa Anita Park in California. The pace bike was replaced by a pace horse for the final stretch, and Jake was led to a stirring come from behind victory by the horse that played Seabiscuit in the movie. On a more conventional track, Cabell ran 3:59.3 for 1500 at Colonial Relays, which puts him 5th on the GRC all-time list. Cabell overcame several obstacles before the race started, including a flat tire on the drive to the meet, and his performance bodes very well for big results to come this Spring. We're at BCC on Wednesday for our normal 7:15 start, so meet for the warmup at 6:30. BCC is on spring break, and the chances are good that the school will be closed, so plan accordingly.